The Hähnel Modus 600T is already one of our favourite flashguns, but it is getting a refresh at Photokina next week. The Modus 600RT Mark II makes two small improvements to the design of this popular hotshoe speedlight. The most visible difference is in the hotshoe attachment itself, which now uses a quick-lock mechanism – rather than the screw locking mechanism found on the original version. The other key change is with the new USB charger. One of the big advantages of the 600RT strobe is that it is powered by a bespoke rechargeable battery – rather then the AA cells used by most other guns. This provides a fast recycle time of 1.5 secs, which is claimed to be four times the speed of rival flashguns. The HLX-MD1 Extreme lithium ion pack provides 600 shots at full power from the flash, which has a Guide Number of 60 (m/ISO100). It can alternatively give 1000 flashes at half power. To make it easier to charge this battery whilst on location, the pack now comes with a new MD1 Mk II charger that can be powered through a standard USB lead. The flashgun has a built-in wireless transmitter and receiver, using the 2.4GHz standard, for simple off-camera operation – allowing the unit to be used as the master or slave in a multiflash set-up. 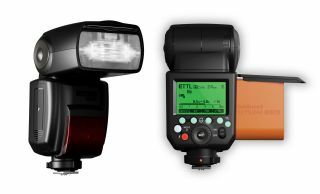 The Wireless Kit pairs the flash gun with Hähnel's Viper TTL wireless trigger – which attaches to the camera hotshoe to fire the flash when used off camera in strobist set-ups. The Wireless Pro Kit comes with a pair of Modus 600RT Mark II speedlights and the Viper TTL trigger.